Gate City II: Religion and Culture IV: Surviving the Holocaust: Well Done, again! WM Mike Bjelajac welcomes our sixty guests. 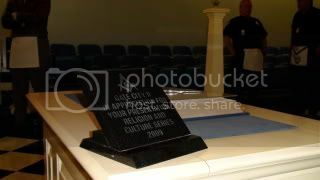 On Tuesday, April 28th, Gate City welcomed the public for another Religion and Culture presentation. The dinner was slow cooked beef brisket, potatoes, field green salad and french bread. 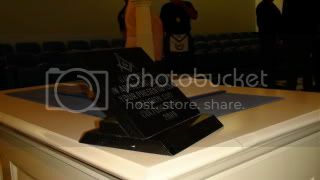 In honor of the evening's presentation, the blessing was given in Hebrew by Ross Laver, Fulton 216. Our guests were served at their tables by Gate City Brethren. 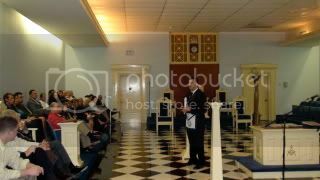 After dinner, the guests adjourned to the South Lodge of The Atlanta Masonic Center. 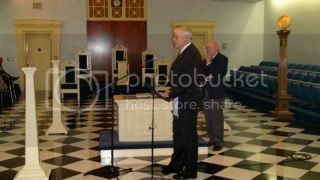 They were welcomed by Worshipful Master Mike Bjelajac. Worshipful Brother David Johnston introduced our speaker for the evening, Murray Lynn. A fourteen year old boy walks a lonely, moonlit dirt road. His unrelenting thoughts have been his sole source of companionship throughout his long trek which has included a daunting pass through the Carpathian Mountains of Hungary. Not three years ago, his father was forcibly removed from the family home only to be summarily executed and buried in a mass grave. For two years, the grieving widow was left to support four sons, all children - she and almost all of her boys would soon follow their father in death, save one - the eldest. Murray survived. So did his memories. He remembers the jeers and insults hurled by onlookers as his family and others in his neighborhood were being led away. They were going to Auschwitz. Auschwitz was Nazi Germany's most notorious concentration camp where nearly three million people died - ninety percent of them were Jews. They died in the gas chamber, by systematic starvation, through disease proliferation, suicides, executions and "scientific experimentation." Murray's family arrived to the concentration camp in the cattle car of a train. They were packed in with a hundred other people. Upon arrival, two lines were formed. Murray's mother and brothers went into the line that lead directly to the gas chamber. Murray went into the line where the suffering was more prolonged. In Auschwitz, they were fed a piece of toast and coffee for breakfast, no lunch and soup for dinner. Around one hundred and eighty five calories a day was the average food intake. A third of Auschwitz inmates died in the first ninety days. It was orchestrated death in slow motion. As Murray recalls, " It was worse than going to the gas chamber. There is nothing more awful than watching people, day after day, die of starvation. After awhile, they are no longer hungry but are in a state of apathy. They told us not to expect to get out of there alive." Every day Murray would take a dozen bodies to the incinerator. Every night those who couldn't take it anymore got up to touch the electric wires and end their suffering. Death was omnipresent. Everyday at 5AM the Nazi's would have a role call. The purpose of the role call was to "cull the herd". They would find the sick and the weak amongst their prisoners and take them to "the hospital." The Nazis would even ask if anyone in the group needed medical attention or if anyone couldn't work any longer. Those that replied in the affirmative were also sent to "the hospital." The hospital to which they were referring was an air tight, cinder block room where they were gassed. As Murray recalls, "no one ever returned from the hospital, we all knew where they were going." Murray described himself as skeletal and weak. A young, adolescent boy working himself to a slow death. He was selected "a dozen times" to go to "the hospital". Whenever selected, Murray would sneak out of the line and join the "healthy" group. Of his most haunting memories, his cousin Sam Green, a large boy, not much older than himself though taller, bigger and healthier, chose to get into the line for the hospital. In horror, Murray looked at the boy and said, "don't get into the line, don't you know where you are going?" The boy looked at Murray and said, "Maurice, I know where I am going. But I will only suffer for ten or fifteen minutes. You will suffer until they kill you." Murray never saw him again. Murray was in Auschwitz less than a year when it was liberated by the Soviets on January 27, 1945. After a three week stay in a hospital, Murray began the long walk home. He didn't know where else to go. He walked from Southwest Poland to his family home in Hungary. Finally, after a year, a long, moonlit dirt road led him home. He knocks on the door. Frightened, the new owner refuses to let Murray enter, "I thought you were all dead!" Murray tells him, "I'm a ghost." Finally, the door opens and for two weeks Murray lived in the house formerly inhabited by his family. His stay was awkward to say the least. Murray was afraid that the new owner would kill him in his sleep. The new owner was afraid that Murray was a ghost. Through a Jewish Relief agency, Murray came to live in England and Ireland. He earned the opportunity to come to America where he completed college in New York. He had no money. He knew no one. He barely spoke the language. He carried insecurities, fears and phobias. He would not wear yellow clothes (the color of the star of David which he was forced to wear). With memories of the horrible train which took him and his family to Auschwitz, he could not ride a train - he would ride on buses instead - which took him twice as long. When he saw a policeman or a soldier he would cross the street. It was the legacy he had to live with. But Murray refused to let the past define him. He staved off the horrible experiences of his early life and moved forward. 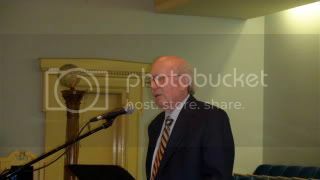 In the past fifty nine years, Murray has become a successful business man, is married and has children and grand children. Many Jews speak of reinventing themselves. After Auschwitz, Murray's faith in religion was eroded. It's the same story of many survivors. They felt that they had a covenant with God to protect them and that God had broken it. They came home bitter and disenchanted with all faiths and religions. They were angry..."but at some point", says Murray, "you have to make peace with yourself". Anger is a pathology of the mind and heart. It is worse for the bearer than the hated. He refused to communicate with survivors for many years. He did not want to become a slave of the past. It was how he ultimately rebuilt his life. He calls himself a born again Jew. Despite his success in life, his nightmares are so vivid that, to this day - more than sixty years later, he screams in his sleep. "Over the centuries, Jews were persecuted because they differed in their belief's and who they were. They were persecuted not for the wrong they'd done, but, for steadfastly holding to their beliefs to honor and uphold the faith of their ancestors. The greatest threat to pluralism and religious freedom are the apostles of purity and fanaticism who claim sole possession of the truth about how to live and what theologies to invoke and embrace. Worse yet, are the dangerous precepts that those who differ in their beliefs are subversive and evil apostates." 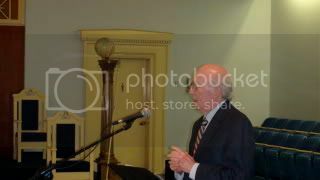 Murray now offers his testimony in the hope that, as his generation passes into history, the younger generation will bear the responsibility of remembering the lessons learned from his era. He hopes that in the face of hatred, future generations will not remain silent. "When any group is degraded, it degrades all humankind. When the fervor of religious passions or political ideologies threaten to stifle the rights of others, no one is safe." After the presentation, WM Bjelajac gave Murray Lynn our custom made appreciation award. Chris Hodapp, Author of Freemasons for Dummies, Django Fan, "Look No Further Than Gate City 2's Example."